1 A None No Power Seat 1 A is a standard First Class seat that has restricted legroom due to the bulkhead. The proximity to the galley and lavatory may be bothersome. There is no floor storage available for use during takeoff or landing. 1 C None No Power Seat 1 C is a standard First Class seat that has restricted legroom due to the bulkhead. The proximity to the galley and lavatory may be bothersome. There is no floor storage available for use during takeoff or landing. 1 D None No Power Seat 1 D is a standard First Class seat that has restricted legroom due to the bulkhead. The proximity to the galley and lavatory may be bothersome. There is no floor storage available for use during takeoff or landing. 10 A None No Power Seat 10 A is a standard Main Cabin Extra seat that has extra legroom. American Airlines classifies this seat as "Main Cabin Extra" which provides additional legroom for an additional fee. 10 B None No Power Seat 10 B is a standard Main Cabin Extra seat that has extra legroom. American Airlines classifies this seat as "Main Cabin Extra" which provides additional legroom for an additional fee. 10 C None No Power Seat 10 C is a standard Main Cabin Extra seat that has extra legroom. American Airlines classifies this seat as "Main Cabin Extra" which provides additional legroom for an additional fee. 10 D None No Power Seat 10 D is a standard Main Cabin Extra seat that has extra legroom. American Airlines classifies this seat as "Main Cabin Extra" which provides additional legroom for an additional fee. 12 A None No Power Seat 12 A is a standard Economy Class seat. 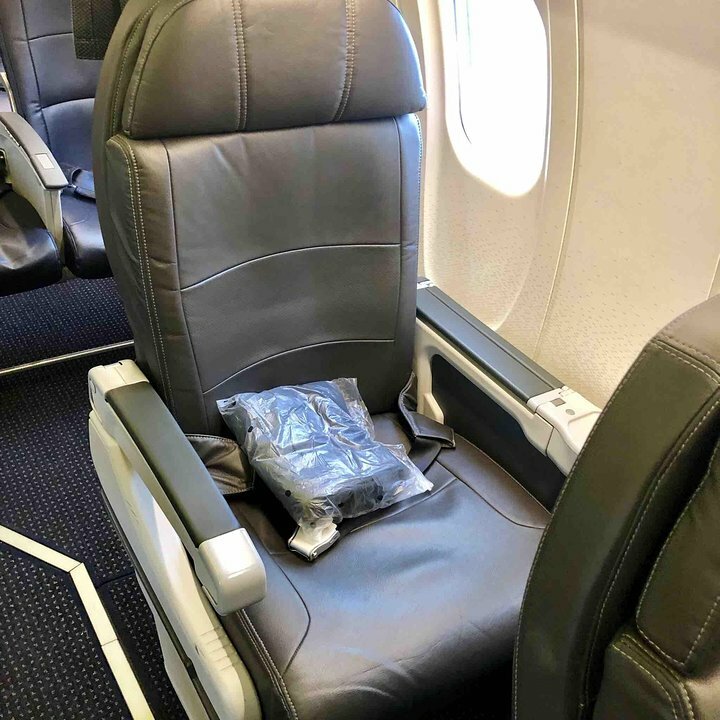 American Airlines classifies this seat as a "Preferred Seat" that is available for an additional fee due to its favorable location. 12 B None No Power Seat 12 B is a standard Economy Class seat. 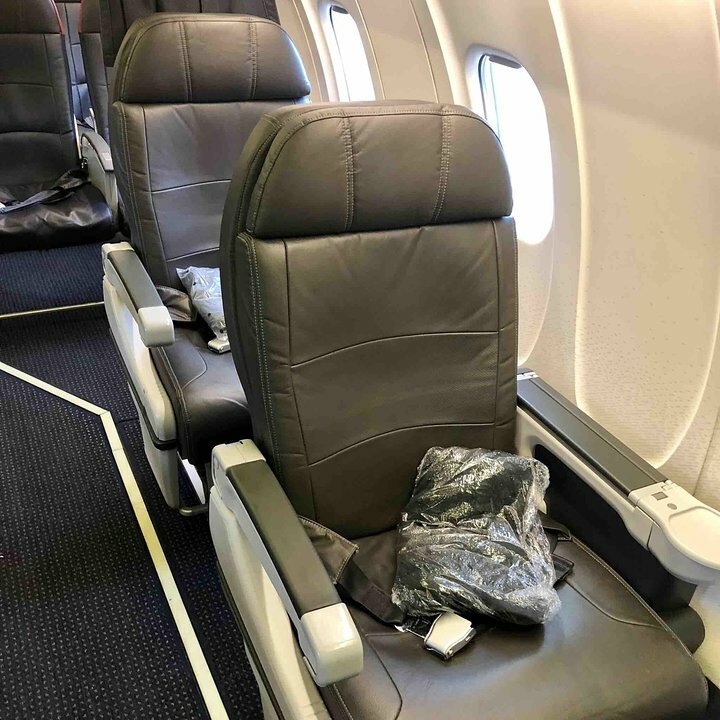 American Airlines classifies this seat as a "Preferred Seat" that is available for an additional fee due to its favorable location. 12 C None No Power Seat 12 C is a standard Economy Class seat. American Airlines classifies this seat as a "Preferred Seat" that is available for an additional fee due to its favorable location. 12 D None No Power Seat 12 D is a standard Economy Class seat. American Airlines classifies this seat as a "Preferred Seat" that is available for an additional fee due to its favorable location. 13 A None No Power Seat 13 A is a standard Economy Class seat. American Airlines classifies this seat as a "Preferred Seat" that is available for an additional fee due to its favorable location. 13 B None No Power Seat 13 B is a standard Economy Class seat. American Airlines classifies this seat as a "Preferred Seat" that is available for an additional fee due to its favorable location. 13 C None No Power Seat 13 C is a standard Economy Class seat. American Airlines classifies this seat as a "Preferred Seat" that is available for an additional fee due to its favorable location. 13 D None No Power Seat 13 D is a standard Economy Class seat. American Airlines classifies this seat as a "Preferred Seat" that is available for an additional fee due to its favorable location. 14 A None No Power Seat 14 A is a standard Economy Class seat. American Airlines classifies this seat as a "Preferred Seat" that is available for an additional fee due to its favorable location. 14 B None No Power Seat 14 B is a standard Economy Class seat. 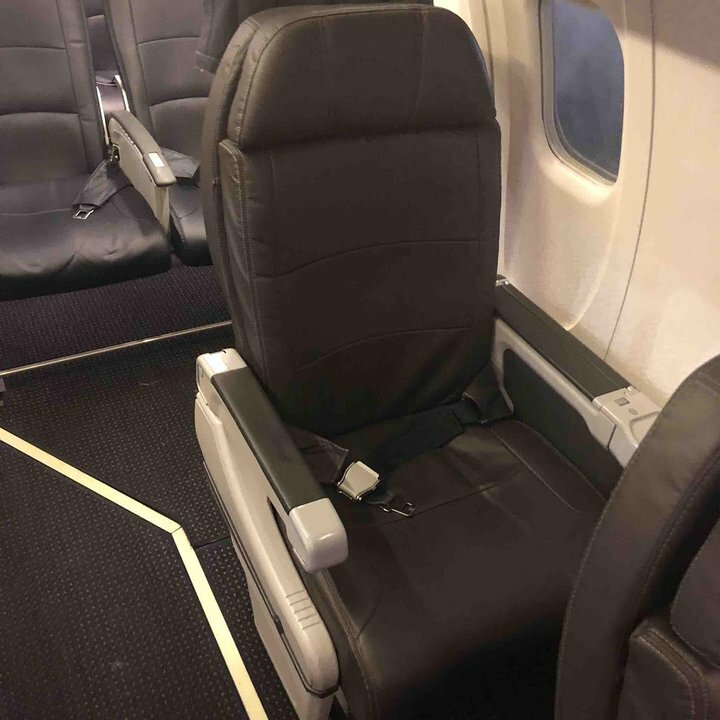 American Airlines classifies this seat as a "Preferred Seat" that is available for an additional fee due to its favorable location. 14 C None No Power Seat 14 C is a standard Economy Class seat. American Airlines classifies this seat as a "Preferred Seat" that is available for an additional fee due to its favorable location. 14 D None No Power Seat 14 D is a standard Economy Class seat. American Airlines classifies this seat as a "Preferred Seat" that is available for an additional fee due to its favorable location. 17 A None No Power Seat 17 A is a standard Economy Class seat with limited recline due to the Exit Row behind. 17 B None No Power Seat 17 B is a standard Economy Class seat with limited recline due to the Exit Row behind. 17 C None No Power Seat 17 C is a standard Economy Class seat with limited recline due to the Exit Row behind. 17 D None No Power Seat 17 D is a standard Economy Class seat with limited recline due to the Exit Row behind. 18 A None No Power Seat 18 A is a standard Main Cabin Extra seat that has extra legroom due to the position of the exit ahead. American Airlines classifies this seat as "Main Cabin Extra" which provides additional legroom for an additional fee. There is no floor storage for this seat during takeoff and landing. 18 B None No Power Seat 18 B is a standard Main Cabin Extra seat that has extra legroom due to the position of the exit ahead. American Airlines classifies this seat as "Main Cabin Extra" which provides additional legroom for an additional fee. There is no floor storage for this seat during takeoff and landing. 18 C None No Power Seat 18 C is a standard Main Cabin Extra seat that has extra legroom due to the position of the exit ahead. American Airlines classifies this seat as "Main Cabin Extra" which provides additional legroom for an additional fee. There is no floor storage for this seat during takeoff and landing. 18 D None No Power Seat 18 D is a standard Main Cabin Extra seat that has extra legroom due to the position of the exit ahead. American Airlines classifies this seat as "Main Cabin Extra" which provides additional legroom for an additional fee. There is no floor storage for this seat during takeoff and landing. 23 A None No Power Seat 23 A is a standard Economy Class seat in the last row of the plane that may have limited recline. The close proximity to the lavatory may be bothersome. 23 B None No Power Seat 23 B is a standard Economy Class seat in the last row of the plane that may have limited recline. The close proximity to the lavatory may be bothersome. 23 C None No Power Seat 23 C is a standard Economy Class seat in the last row of the plane that may have limited recline. The close proximity to the lavatory may be bothersome. 23 D None No Power Seat 23 D is a standard Economy Class seat in the last row of the plane that may have limited recline. The close proximity to the lavatory may be bothersome. 8 A None No Power Seat 8 A is a standard Main Cabin Extra seat that has extra legroom due to the position of the First Class seat ahead. American Airlines classifies this seat as "Main Cabin Extra" which provides additional legroom for an additional fee. The tray tables are in the armrests, making the armrests immovable and slightly reducing the seat width. There is no floor storage for this seat during takeoff and landing. 8 B None No Power Seat 8 B is a standard Main Cabin Extra seat that has extra legroom due to the position of the First Class seat ahead. American Airlines classifies this seat as "Main Cabin Extra" which provides additional legroom for an additional fee. The tray tables are in the armrests, making the armrests immovable and slightly reducing the seat width. There is no floor storage for this seat during takeoff and landing. 8 C None No Power Seat 8 C is a standard Main Cabin Extra seat that has extra legroom due to the position of the First Class seat ahead. American Airlines classifies this seat as "Main Cabin Extra" which provides additional legroom for an additional fee. The tray tables are in the armrests, making the armrests immovable and slightly reducing the seat width. There is no floor storage for this seat during takeoff and landing. 8 D None No Power Seat 8 D is a standard Main Cabin Extra seat that has extra legroom due to the position of the First Class seat ahead. American Airlines classifies this seat as "Main Cabin Extra" which provides additional legroom for an additional fee. The tray tables are in the armrests, making the armrests immovable and slightly reducing the seat width. There is no floor storage for this seat during takeoff and landing. 9 A None No Power Seat 9 A is a standard Main Cabin Extra seat that has extra legroom. American Airlines classifies this seat as "Main Cabin Extra" which provides additional legroom for an additional fee. 9 B None No Power Seat 9 B is a standard Main Cabin Extra seat that has extra legroom. American Airlines classifies this seat as "Main Cabin Extra" which provides additional legroom for an additional fee. 9 C None No Power Seat 9 C is a standard Main Cabin Extra seat that has extra legroom. American Airlines classifies this seat as "Main Cabin Extra" which provides additional legroom for an additional fee. 9 D None No Power Seat 9 D is a standard Main Cabin Extra seat that has extra legroom. American Airlines classifies this seat as "Main Cabin Extra" which provides additional legroom for an additional fee. Non-alcoholic beverages are complimentary. BBeer, wine, and a variety of spirits are complimentary in First and Main Cabin Extra. They may be purchased in Main Cabin. The CRJ-700 is a regional jet used on short-haul routes. There is a slight view out the window, unless the person in 18A reclines or closes the shade. Otherwise this window seat has no window. 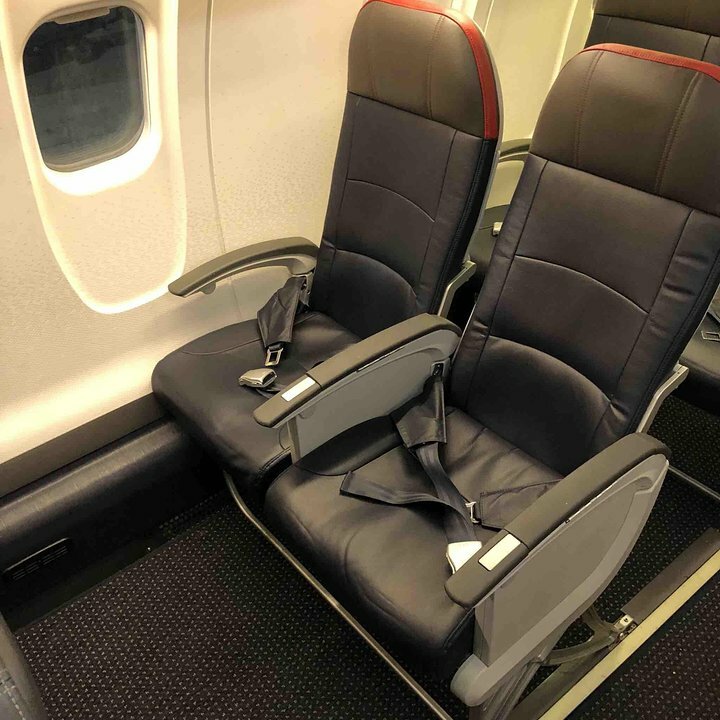 This seat should be red on AA's CRJ 700's with 16 MCE seats. This seat had nowhere close to 31 inch seat pitch. It was more like 29 inches. I'm tall, and the FA took pity on me with me having to sit sideways due to my knees jamming into the back of the seat in front of me, and let me move to the exit row behind. I can manage 31" pitch sitting straight. Not the case on this seat. This seat may be fine on those planes which do not yet have the enlarged MCE section, but on those that do...stay away! This seat is the best one on the aircraft in terms of leg room (including comparison to the first class seats). Also, it does have underseat stowage, in contrast to the description provided by seatguru. This seat 14B was in MAIN CABIN preferred. I used VALET service for my roller bag. Seat was not held bad considering I'm 6'2" and not petite. Decent support. My neighbor must have not had enough room as they kept encroaching into my space. Let me change this just a bit, tiny but not bad?? Im 6 foot 5 inches tall and this MCE seat has plenty of room. First class is just fine in this 2-row section: modern, comfortable, attentive service on the short ABQ-PHX leg. Near-zero overhead space for 1st-class, but always able to work something out nearby or valet check the bag. ANY ABQ filgt is an e-ticket ride on a summer afternoon but if they serve hot drinks, count it as "smooth." Small 1st class cabin is welcome as is non-stop service to Santa Fe from the West. Plenty of room and service for this short flight. I flew with the CRJ-700 from Detroit to Chicago O'Hare. Although the incoming flight was delayed over 40 minutes and no one was at the gate, the flight left pretty much on time and landed early at O'Hare. Because of the small size of the plane the flight felt like a sports car ride. The board service was ok, and the seats were pretty comfortable for a regional jet. All in all it was a great experience, flying with a smaller plane. 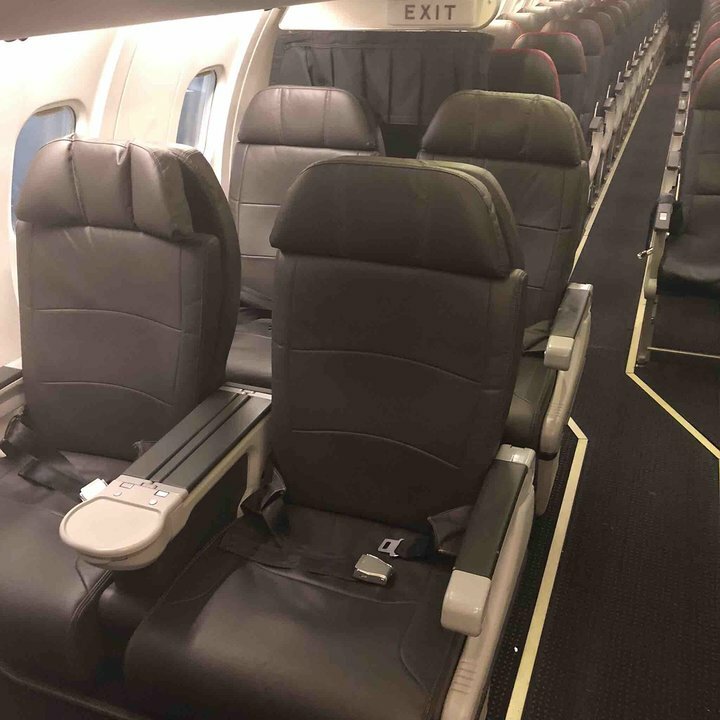 American Airlines flies 2 versions of Canadair Regional Jet 700.